On a gray, June-gloom day like this, nothing beats a bowl of hot soup with noodles, and oh yeah, a side of crispy fried pork chop to go with it. I figure it's an ideal time to enjoy this wintery meal before the weather gets too hot. My favorite joint for this soul-warming dish is Nice Time Deli in Irvine. 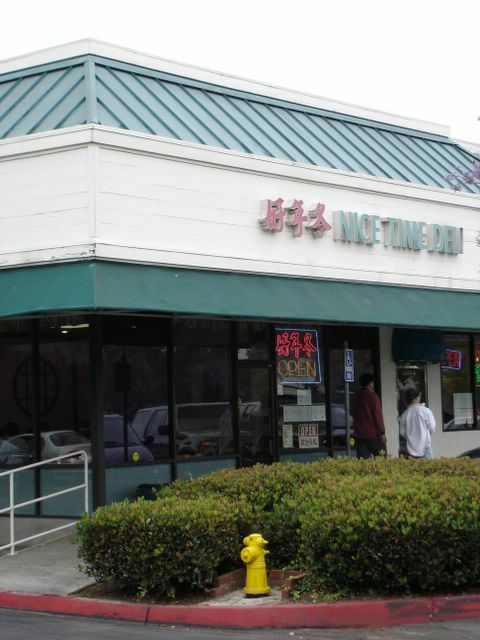 Located at the 99 Ranch plaza on Walnut and Jeffrey in a row of shops that also houses Kaju Soft Tofu and a veterinarian, you'll find famished students from nearby UCI and IVC scarfing down the next best thing to mom's homecooking. Nice Time Deli is the last shop on that building, with glass windows making up two of its four walls. It's a cozy spot to gaze at people passing by and the traffic zooming past on Interstate 5. The waitresses speak a limited number of English words, but they're friendly and are always sporting a smile, especially the tall one who seems to be in charge. The dishes they serve are simple, rustic. Taiwanese food, I think, is the soul food of Asia. Unlike Sichuan or Hunan fare, Taiwanese cooks utilize a minimal amount spices. The flavors are muted, but hearty, and the food presentation is straightforward rather than showy. This is a cuisine born out of the home. A typical Taiwanese dish is Pork Chop Rice. A mound of hot rice is doused with a dark saucy blend of soy-stewed ground pork, tofu and egg. 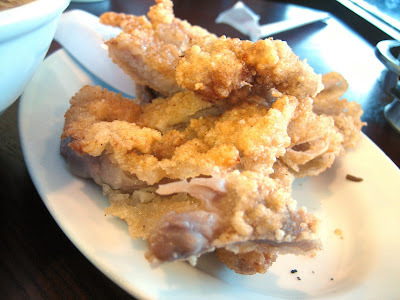 A helping of stir fried cabbage goes on the side, and a fried pork chop the size of your face is heaped on top. A substantial meal and a satifying one for about five bucks. My favorite though is the Pork Chop Noodle Soup. 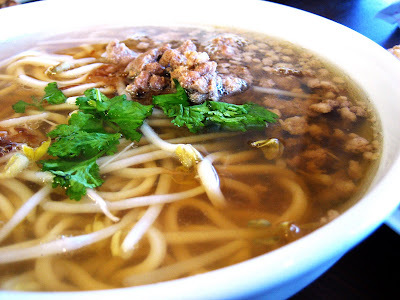 A large bowl of egg noodle swims around in a pork flavored broth, topped with ground pork meat, bean sprouts, and a sprig of cilantro. On the side, on a small plate, you'll be served the fried pork chop. The meat is cut into flappy fingers up to the bone, designed for easy ripping. Crisp, with a light bubbled batter, and seasoned with pepper, these pale strips of tender swine are also slightly sweet, providing a nice counter to the salty soup. hmm, i'll have to try this place sometime! Yup! Had I been in Rowland Heights, I would have had a "good time"! Ha! Good Time Cafe - we used to live in Rowland Heights!!! There is a tawianese deli across the street in the Der Weinershitnzel center. This is where Taiko is. Its in the back. Real Taiwanese food. Try the water dumplings. They are awesome there. They make the skins from scratch so they are chewy and have a great mouth feel. Are you talking about A&J or something like that? Haven't tried that place but always been curious. NO, I forgot the name. Its in the back though. It doesnt say "taiwanese food" either. Crap...if I go by again, I will get the name. Its literally in the back and the restaurant that bordes up next to the asphalt. I just remembered the name of the restaurant! Its Oshin. Oh! O'Shine. I've been there a few times about three years ago. Never tried their dumplings but their Hong Kong style cafe dishes weren't anything to write home about - a steak dish had a yucky gloopy sauce. I guess they do better at the Taiwanese food than the Hong Kong Style Cafe food, which dominates their menu. I do remember that about 10 years ago, their food was much better. Maybe they changed ownership or something. How about A&J? Have you tried it and what do you think of it? Been to all 3 restaurants... A&J has the best beef noodle soup, Nice Time has very good pork chop rice & that corner Hong Kong style cafe food was not too impressive w/ the food at all. I've been to A&J before and their beef noodle soup is pretty good, but it's authenticity is not as true as it used to be. I prefer the beef noodle soup at New Shanghai more (next to Nice Time Deli, where I am planning to go to soon). It tastes more fresh, from the noodles to the beef. If the choice of vegetable serves as any indicator, instead of the bok choy that A&J uses, New Shanghai uses the authentic spinach with the soup. Ironic that they got it better than A&J with "Shanghai" in their name. It looks like O'Shine finally bit the dust about a half year ago. They've been replaced by something called the Red Onion Cafe. And I'm in no hurry to try it. Will have to try New Shanghai for the beef noodle soup. But I'll wait until the weather is cooler. Lately it's been too hot for soup! Great blog. As an Irvine foodie myself, I really enjoy it. Keep up the good work. FYI, Red Onion Cafe is Oshine with a facelift. The owner is the same. The booths have been reupholstered, and the place has been redecorated, but the cooks are still the same as well. They've slimmed down their menu to emphasize their Taiwanese cuisine more. As a Taiwanese-American, I have to agree with you that the food at Red Onion is nothing spectacular. It is, however, good hearty fare with a home-cooked feel. I tend to eat there when I'm feeling homesick for my grandmother's cooking. As a side note, have you tried Frenzy Sushi (www.frenzysushi.com) over on 17th in Costa Mesa? It's my favorite sushi spot for high quality fusion sushi. Sushi Shibucho comes in at a close second for traditional. I'd be very interested in reading about your opinion of Frenzy. I think the Red Onion Cafe is gone. Drove by and saw empty store. Good Time Cafe and Nice Time Cafe may be owned by the same family. I know Good Time Cafe has a related restaurant in OC. As well as one in San Gabriel. And used to have one in San Jose. I was dining at Kiraku Ramen in Gardena and noticed that Nice Time Deli was listed as one of the restaurants owned by the same owner. Since there's been a change of ownership I'm not sure what the current status is. Haven't eaten at Nice Time Deli since though.